Andrew Brandt, of US firm Blue Coat, contacted the BBC after hearing an episode of BBC Radio 4's You and Yours that discussed the phishing scam. The malware encrypts victims' files and demands a ransom be paid before they can be unlocked. The phishing emails told recipients they owed hundreds of pounds to UK businesses and that they could print an invoice by clicking on a link - but that leads to malware, as Mr Brandt explained. 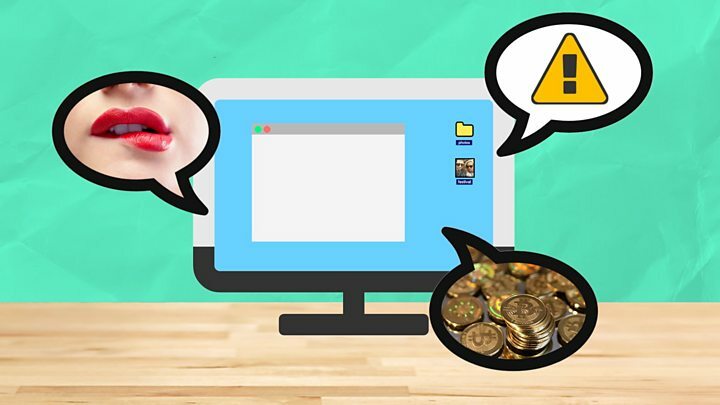 "It's incredibly fast and by the time the warning message had appeared on the screen it had already encrypted everything of value on the hard drive - it happens in seconds," Mr Brandt told the BBC. "This is the desktop version of a smash and grab - they want a quick payoff." Maktub doesn't just demand a ransom, it increases the fee - which is to be paid in bitcoins - as time elapses. One remarkable feature of the scam emails was the fact that they included not just the victim's name, but also their postal address. According to Dr Steven Murdoch, a cybersecurity expert at the University of London, it's still not clear how scammers were able to gather people's addresses and link them to names and emails. In a statement, the firm said: "Ebay works aggressively to protect customer data and privacy, which is our highest priority. "We are not aware of any link between this new phishing scam and eBay's data. "We continually update our approach to customer data security in an effort to create the safest environment possible for our customers." The UK's national fraud and cybercrime reporting centre has been flooded with queries from people targeted by the scam. "We have been inundated with this," said deputy head Steve Proffitt. "At Action Fraud on Monday we received an additional 600 calls and from then onwards we've received 500 calls to our contact centre a day," he added. Referring specifically to Maktub and the approach taken by the phishers, Dr Murdoch said he believed the scam was "significant" in more ways than one. "It also appears to be quite widespread - I've heard about it from multiple sources so it seems like they were fairly successful getting a lot of these sent out," he told the BBC. "However, every person that does that makes the business more valuable for the criminal and the world worse for everyone," he said.